Why Is This 1985 Corvette Somehow Worth Over $1 Million? A typo? Possibly, but it hasn't been noticed in over six weeks. When browsing various online car auction and sales sites, we often come across interesting and often bizarre cars for sale. How do you think we came up with the idea for Car Mod Atrocities all those years ago? But in one our latest searches we found this: a 1985 Chevrolet Corvette that’s for sale in Canada. No big deal, right? 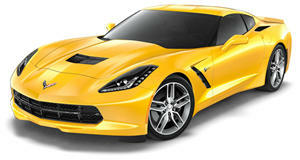 After all, Canadians like Corvettes, too. But here’s the kicker: its $1,350,000 asking price. A typo? It could be, yes. However, it’s been posted on Autotrader.ca for six weeks, more than enough time for its seller to realize and correct the error. Only they haven’t. The pricing configurator is pre-set with an interest rate of 8.99 percent for a 60-month term. That’s an insane $28,017 per month. For five years. But let’s examine the Corvette itself. Could it somehow, however unlikely, be worth over a million big ones? Here’s the seller’s exact description: “Beautiful Little red corvette! 1985 Greenwood V8 professionally built! This car goes! Tires and rims worth a few thousand dollars alone. Automatic shift kit adds to the giddy up of the 500 plus horses under the hood! 500 plus you ask yes it is! “The number wasn't grabbed out of the air, that's what the engine builders told me. Holley computerized fuel pump with laptop plus all the other work receipts have been kept. Car has to been seen and heard to appreciate! Call Bill.” Honestly, Bill, think we’ll pass on this one. We're sure you like your car and all, but you may want to double check the posting. There's a reason why it hasn't sold yet. Also Bill, more pictures are needed in your ad because if you don't have pictures, you've got nothing.